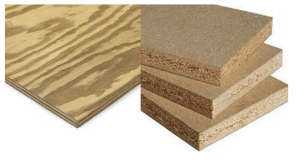 Plywood, Particle Board, MDF, Hardboard… where do we go from here? 02 May Plywood, Particle Board, MDF, Hardboard… where do we go from here? There has been some form of fake wood for a long time now. For the sake of simplicity, let us suppose that the term fake wood is any wood-like material that has been manufactured rather than cut straight from the tree. When I was very young I thought there was wood and there was fake wood. I didn’t know anything about how or why plywood existed but I knew there was a difference between it and real wood and I simply thought all fake wood was called “plywood.” Then my brother explained to me that there was a difference between normal plywood and particle board. He dismissively said that the only thing particle board was good for was stereo speakers. Years later I worked for a furniture repair shop and I learned that a lot of wooden things are made to look very nice and expensive by gluing wood veneers onto cheap “wood” panels like plywood or particle board. That was really the first step in learning about the interconnected relationship between wood and the various wood composite products and perhaps just as importantly, what is the definable difference between them. Why make composite wood in the first place? Composite wood is considered by many to be a cheap substitute for real wood. And there are very logical reasons for this. 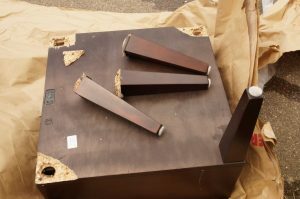 Ikea has created a small empire by selling cheap disposable furniture that falls apart as you use a drill to put screws into or even pull screws out of the particleboard panels that are used to create the bulk of their products. It’s no mystery as to why this trashy furniture would create a lasting stigma in the collective conscience. But don’t let this turn you off to composite woods all together. In general, composite woods are wood-like panels that are formed out of leftover wood chips, shavings, or sawdust mixed with a resin. This makes for a fairly heavy board that is cheap to make and ideal for some projects. Many composite panels are waterproof, insect-proof, and even fire proof. Each composite wood has a different set of strengths and weaknesses or pros and cons. Plywood is actually very different from the fiber boards. It’s a totally different animal. Plywood is made by sandwiching layers or “plies” of veneer and wood chips into strong cross-pattern designs. This results in very strong wood-like panels. The quality and thickness of the plywood can make a big difference in how strong it will be. Although plywood is a fairly inexpensive “fake wood,” when made well it is very strong. This is one of the reasons that it is used to make cabinet bodies by many of the best cabinet companies; RTA and Custom alike. Plywood is also used to make heavy duty road cases for transporting film and music equipment. A big advantage of plywood is that the small bits that are used to make it may be small but they are still wood. This means that even without an outer layer of wood veneer, plywood will take wood stain far better than MDF or other fiberboards. 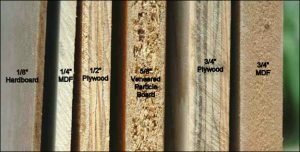 It is possible to find cheap plywood that is more affordable when you compare it to each of the composite woods with a fair comparison chart. * But this sort of pricing becomes very complicated because there are several different qualities of plywood. Without getting too deep into it, the cost as well as some of the various properties of the plywood that you buy will change depending on certain factors. Premium plywood costs more to manufacture and is stronger than the weaker everyday plywood you would find in hardware stores. Many high end furniture and cabinet companies use the plywood that is made to be formaldehyde free. This also adds to the cost of the material. Finally the cost can be further complicated by the outer layers of the plywood. Raw plywood where you can see the cross pattern wood chip texture is quite a bit cheaper than plywood with a layer of wood veneer on either side or laminate surfacing for that matter. Particle board is the lowest form of composite wood material. It is made from sawdust and resin. Imagine if you collected all the sawdust off the floor of a woodshop for a few years and glued it all together again. This material is pretty good for some projects like making speakers. Particle board does not hold up well. 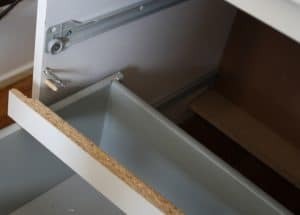 If you try to screw something into a particle board panel it will hold until the object or the panel are pushed pulled or jostled in any way. The tiny chunks of wood will begin to crumble and deteriorate. Water damage also tends to cause particle board to deteriorate as well. As a kid my friends and I used to find discarded panels of particle board that were left out in the morning dew and we would kick and chop them in half like martial artists. Furniture made from particle board has to use rather thick panels in order for it to be relatively strong. For this reason that kind of furniture tends to be excessively heavy. In terms of both quality and cost, it is the cheapest of the composite woods. Particle board is also more affordable than most plywood. This is why it is used for disposable furniture like Ikea. MDF is a material that is made from mixing small fibrous bits of wood with resin and binding agents and then pressing them into panels of wood-like material. MDF is much denser and therefore much stronger than particleboard. Quality MDF is stronger and more flexible than cheaper plywood. Many times you will find MDF being used in place of plywood on some projects. Where MDF really excels is as a substrate for veneer, thermofoil, melamine, vinyl surfacing, or heavy lacquer paints. MDF is also used to make a lot of moldings. MDF, like particle board, is made of small fibers so there is no wood grain. Keep that in mind if you plan to make something to match your existing furniture. You will need a wood veneer in order to stain it. 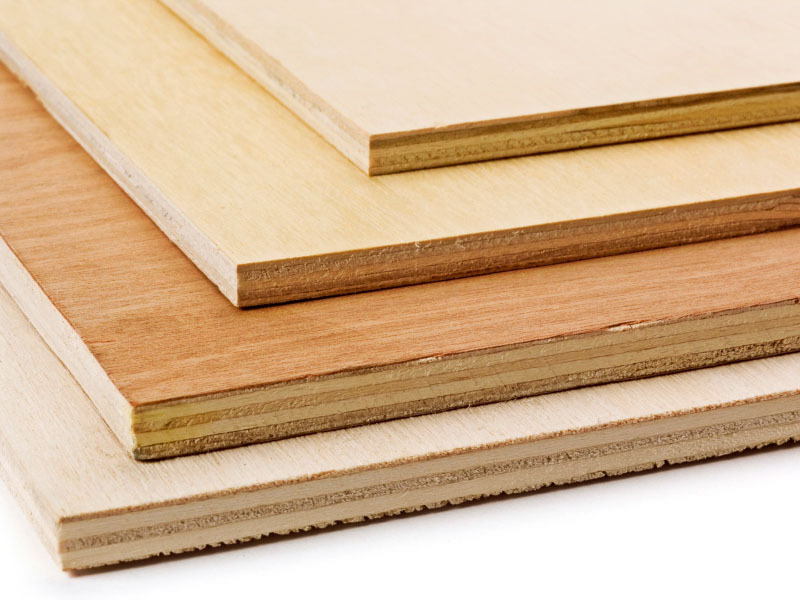 In terms of Cost, MDF is notably more expensive than particle board but it is often used as a lower cost replacement for plywood because it can usually be found for less than the good premium plywood. You can feel how MDF is heavier than plywood if you compare them directly, so keep that extra weight in mind for any future projects. 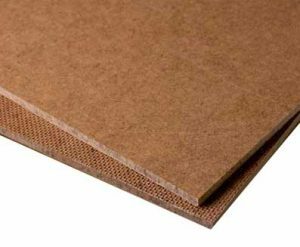 Hardboard is a fiberboard like MDF but it is made out of EXPLODED wood fibers! This allows it to be much denser and therefore much stronger than MDF. The fibers in hardboard are usually compressed to around 65 pounds per cubic foot! (some sources say as high as 90.5 lb.) One of the methods for manufacturing hardboard was patented by William H. Mason; you can find it in stores under the brand Masonite. Two of the most common uses for hardboard are pegboard, a perforated form of hardboard that is used to hang hooks for tools and other objects, and as a surface for skateboard ramps and halfpipes. When compared to MDF and particle board, hardboard has a number of great advantages like it’s superior strength, durability, and water resistance. It can also be easier to work with. 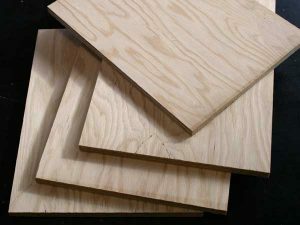 Unlike plywood and other fiber boards, hardboard is only sold in thin ⅛ inch or ¼ inch thick sheets. Because it is so strong and durable, hardboard can often perform as well, if not better than, other fiber boards that are 3-6 times as thick. This makes it hard to compare the price of hardboard in a fair way. If you only need a sheet of fake wood and ANY of these materials will do, a sheet of hardboard can cost less than $10. To complicate the matter further, some companies sell a less dense hardboards that use a “dry” manufacturing process and call it HDF or thin MDF. After learning about MDF, I was intrigued about why it was called “Medium” density fiberboard. I started seeing some companies advertise that their cabinets, their bookshelves, etc. were made using HDF, or High Density Fiberboard. For some time I simply thought this was a form of MDF that they were calling HDF as a marketing ploy. In other words, “our product is even stronger than their MDF!” It didn’t take long for me to realize that all these fiberboard composite woods were related. LDF (low), MDF (Medium), and HDF (high), are actually Particle board, MDF, and Hardboard, respectively. These materials are usually sold in 4’x8’ sheets. 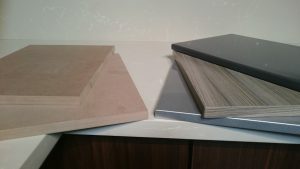 But the thickness of the sheets can vary so to be fair this shows approximately how much you would pay for each material if it were in a ¾ inch thick 4×8 sheet and based on that price how much the material itself would cost per cubic foot. (even though you do NOT buy it in that way) The approximate density of each type of fiberboard is also listed.